On Saturday, April 28, we decided to visit one of Colorado’s state parks. Specifically, Barr Lake State Park. Barr Lake is one of three state parks within an hour and a half of where we live, and we have not visited them in the six years that we have lived here. The other two are the Rocky Mountains Arsenal National Wildlife Refuge, and that Jackson Lake State Park. As a point of interest, it should be noted that since I do not have the use of my right arm, I am using Dragon Naturally Speaking, which is a speech to text program. I am sitting here with headphones and a mike and I am speaking the words that are being written. I should also note that while this is an incredible tool, it isn’t particularly adapted to someone who stutters, and I do have to make some corrections by hand. I should also point out that I don’t particularly type very well with my left hand, and that I might miss some things. Anyway, to continue . 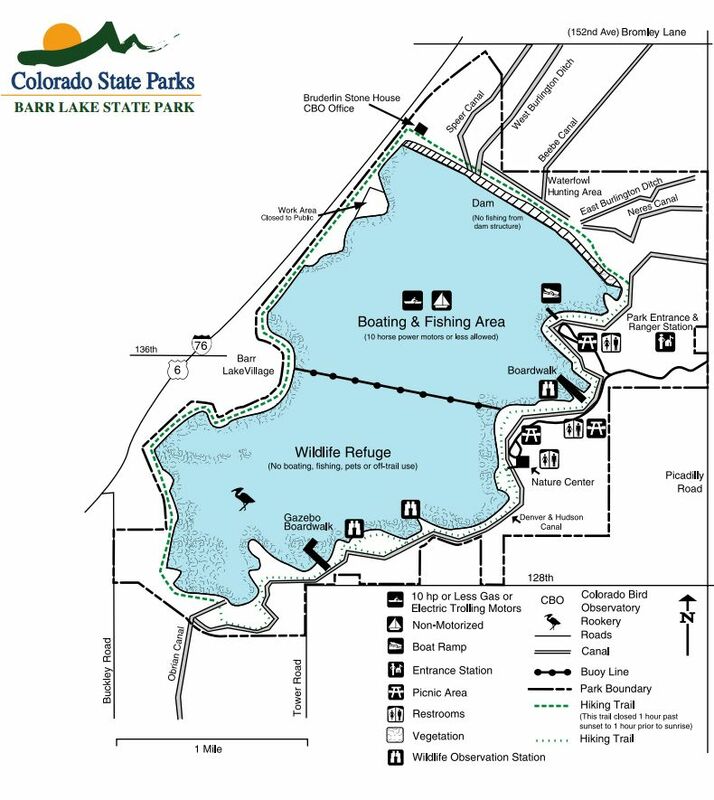 . .
Barr Lake State park is at exit 21 of I-76, just Northeast of Denver. Very nice setting, and lots of stuff to see. The original plan was to visit both Barr Lake and Jackson Lake state parks. The two parks are within an hour of each other, and are both along I – 76, just north east of Denver. The Rocky Mountains Arsenal refuge is actually closer, and much larger than the other two combined. Unfortunately, the majority of it is only accessible via a bus tour for which you need reservations. As of this writing, they are taking reservations for June. Off particular interest to me are Burrowing Owls that inhabit the refuge. We’ll plan a visit after my recovery. the views from the path are spectacular. We hate driving through Denver. We used to take the E – 470 bypass, but now it costs about $18-$20 to go through it, and it’s just a tad too steep a price to pay to avoid mingling with idiots. Luckily, the traffic this particular Saturday morning was not too bad. We arrived at the park in a fairly good mood, and the only thing marring the arrival was the realization I left my hat at home, we forgot our walking sticks, had no sun-block or bug spray, and were not sure about what we should wear. When we got there, a stiff breeze was blowing and it was pretty chilly, but it was supposed to get fairly warm, especially with no clouds in the sky. I bought a goofy looking hat, and we started off on the 9 mile loop that goes around the lake. Mind you, we were not planning to go all the way around. Our interest was to walk on the preserve-half of the park to try and see the following; the nesting owls, the nesting eagles, the nesting ospreys, the white pelicans, and any other winged denizens of the Park willing to pose for us (me). Did you ever wonder where centipedes come from? This is the Rocky Mountains Brown Centipede Tree. Once they turn, these fall to the ground and scurry off. Okay I’ll stop doing that. This is honeysuckle . . . there were two plants about 70 feet apart, and they smelled up the whole area. There are many marshy areas around the lake. It’s the perfect habitat for Canadian geese as well as other waterfowls. This rabbit was sitting just to the edge of the path. I would never have noticed him, except he moved. This guy was very small, and totally unconcerned with our presence a scant few feet from him. He just went about his way, doing rabbit stuff as I snapped away with the camera. This ranks as one of the better pictures from the excursion. He started to scratch his nose and I caught him in mid-stroke. As I said, he was unconcerned with me snapping pictures. There’s lots more in the SmugMug album. But it was not just the birds and the animals; the shoreline was interesting as well. For instance, this particular root system caught my eye. And of course, always the background of the lake. Those are some of the white pelicans I was interested in, which unfortunately never swam close. This is a Western Grebe that played hide and seek with me. Whenever he saw me raised camera, he dove. However, I did manage a couple of shots. If one looks at the map at the beginning of the post, one can see there is a walkway to a gazebo well onto the lake. The following shots were taken from the boardwalk leading to that gazebo. I should point out, we were quite a ways away, as you cannot get close to Eagles nests. Essentially, I’m shooting across the lake, and the boardwalk is not the most stable of platforms. Neither was the gazebo. Any movement along the boardwalk jostled the tripod and resulted in many a blurred pictures. The great distance also limited the clarity of the pictures, especially since it was over water and the sun was evaporating it. Nevertheless, the nesting Bald Eagles. The setting was nice. Wish I could’ve gotten better pictures. These look good as they are, but if one zooms in, they don’t look very clear or sharp. Just to the east of the eagle nest, some seagulls and pelican’s were resting. At one point, one of the Eagles flew off. After playing with various settings and zooms, I determined I wasn’t going to get any better pictures, and I turned my eyes to other things.
. . . look to the left . . .
. . . look to their right . . .
. . . Dive!! Dive!! Dive!! It is a very scenic lake . . . Walking back to shore on the boardwalk, I noticed a couple of very rare specimen . . .
. . . the Dreaded Rhinoceros Forest Pyranha . . . Very Dangerous!!
. . . and Great Horned Unicorn Forest Whale. Both were laying very still, trying to pass as a dead tree trunk. Ha! . . . I spotted them right away! another rare picture, this time of the Unknown Mayan calendar, which predicts absolutely nothing with regards to the coming end of the world. As we rounded a corner of the trail, we saw this great blue Heron in the Denver & Hudson canal that follows the lake for a portion before branching off. he was backlit, and a long ways away. We stopped, but unfortunately, the couple ahead of us just kept on walking, and the heron flew off. again, because it was far away, and I was shooting hand held, these are not the best of pictures. However, I am reasonably pleased with the setting and with the reflection of the bird in flight on the water. The Rangers had told us the location of a Great Horned Owl nest, but warned us that the foliage would make it difficult to see. The spot was marked by a red ribbon on the three branch by the side of the trail. There were four of us trying to locate the birds and nest, and the other couple left after about 5 min. It took me another 5 min. to realize that what look like a piece of broken three branch was actually an owl sleeping. It looks obvious here, but keep in mind this is zoomed in quite a bit, and the exposure was adjusted so that everything is a little lighter. We were maybe 100 feet away, and the owls were maybe another 30 feet up, under a dense canopy. I should’ve snapped the picture showing what it looked like with the naked eye. Much more difficult to see. This owl looked like it was sleeping, and at no time while we were there did I notice it opening its eyes. However . . .
. . . Melisa noticed another owl a little bit farther up to tree . . .
. . . This one was not sleeping . . . It did not look particularly friendly. There there are many more pictures of the owls in the SmugMug gallery, but as they did not move much, they are mostly the same shots where I attempt to get better resolution. After a while we continued with our walk. As it got very warm, and we were overdressed, we decided to head back to the car, and toward the Osprey nest. This is the West Colorado Gopher Snake http://bit.ly/aqcZeX). Some people, including the the person at the visitors center at the park, erroneously call it a Bull Snake . . . but they are wrong, at least as far as my research indicates. This snake was right at the edge of the footpath, and the lady ahead of us almost stepped on it. Normally I would have snapped hundreds of photos, but as we were hot, and were still interested in seeing the Ospreys, I limited myself to just a few.
. . . a couple of interesting things on this photo . . .
First, there is the pelican. Second, you can see a rather large fish halfway out of the water just above the pelican. Whatever they were, they were jumping all over the lake and they’re not small. Big splashes whenever they jumped. And third, in the back you can see the store where corporations buy the politicians who do their bidding. Finally, here we are at the Osprey’s nest. The shot above is after its mate went off to hunt. The SmugMug gallery has many more shots, probably too many, but it does tell a narrative of the time we were there. I’ll only include a few shots here that I found interesting. One bad thing happened while we were there . . . I mounted the 80-400mm lens on the camera, mounted the camera onto the tripod, and then wanted to hang my camera bag on the tripod to help stabilize it in the wind. In a first for me, I did not zip up the camera bag prior to removing it from my shoulder. My $1600 70-200 mm lens flopped onto the gravel of the path. It is now the very first all my lenses which is not in pristine condition. It is the only one of the 10 or 12 lenses I have with any marking on it indicating someone has used it, or in this case abused it. I was not happy, but all the useful lessons in life are hard ones. As I waited for the Osprey to come back, I missed two Swainson’s Hawks circling above and then slowly dropping to their nest less than 60-70 feet from us. I also missed a number of pelicans who were gathering just behind us flying in circles. At one point there must’ve been over 20 circling right over my shoulder . . . And me waiting for the Osprey to come back. one of the Hawks had already flown off, and the other one sat there looking at me, probably not happy with my presence. Unfortunately, with all the moving around, I ended up with a fuzzy picture of the Osprey coming back to the nest with a fish on its talons. Not only that, but guess who has an expensive camera that can take moving pictures, but who did not remember to shoot a movie? Oh well, I did get some nice sequences of the one Osprey sharing the fish with the one in the nest, the one in the nest hopping out to eat the fish, while its mate replaced it in egg-sitting duty.
. . . here you go . . .
Another sequence that would have been great as a movie is of the Osprey hopping back on to the nest after finishing its meal.
. . . up . . .
. . . control the wind . . .
. . . prepare for landing . . .
. . . Touchdown!! . . .
We waited a little longer to see if it would fly off again for more hunting, but after another 20 min. or so, we decided to pack it in. On the way back to the car, I had to snap a picture of this thing and the ant that was all over it.
. . . normally I make up some clever name, incredibly witty, and insanely amusing . . .
. . . but in this case I really wanted to know what this thing was . . .
. . . and I ended up spending close to one hour searching the Internet for something that looked like it . . . It’s a wild cucumber. At least that’s the best that I could figure out; if anyone knows any different, please let me know. By the time we got back to the car, it was too late to think about Jackson Lake State Park. For one, we would not have been able to do it justice. The plan, once I recover from my surgery, is to go back and visit each of the other two, and then repeat as often as necessary to get thoroughly tired of the places . . . something I think might take a number of years to occur. I hope you enjoyed the journey I shared as much as I enjoyed sharing it. As always, thank you for reading my stuff. Note: Please forgive any misspellings and other errors as sometimes the program cannot understand my weird accent, stuttering, and mumbled words, and I probably missed them while proofing. This entry was posted in Barr Lake State Park, Colorado, Photography Stuff, Reptiles, Travel Stuff and tagged American Coots, American White Pelican, Bald Eagle, Barr Lake State Park, Black and White Photography, Canadian Geese, Colorado State Park, Great Blue Heron, Great Horned Owl, hawks, Hawks in Flight, Nesting Bald Eagle, Nesting Osprey, Osprey, Photography, photography stuff, Swainson's Hawk, West Colorado Gopher Snake, Western Grebe, Wild Cucumber, WPlongform. Bookmark the permalink. I’m surprised (though I shouldn’t be) that you are back in the blogging saddle so soon. Great story and great photos. Thanks. The pictures were ready last week . . . the chore was arranging the post. It helped me focus on something beside pain. Thanks . . . I always wonder is people notice, care, or find humor in them. Girls like bb trees too. What can I say . . . I’m predisposed to identify with my own gender. Cool pix. The owl was very cute. I am really surprised to see you back so soon already… but I already read in you reply that you had to arrange this ‘only’ I think that is quite a job as well. Sorry to hear you are still in so much pain…hope that will be over very very soon! Love your story and your photos… Just amazing. The rabbit scratching his nose is funny… the owl really looks angry, wouldn’t come in his neighbourhood, the grabe looking left looking right made me laugh and I can go on and on. I’ve enjoyed your post as usual!! Thanks for sharing such wonderful pictures with the world. Very lovely to see. Your photographic skills is marvelous. Sorry to hear about your lens. That strange shell pod with the ant running between its spikes is called a wild cucumber, aka Echinocystis lobata. There are only a few places in the park where they exist although they’re common in the US according to the USDA plant database. Love all the osprey landing shots; your favorite shot there is mine too. It looks especially graceful there with the position of its wings. Pissed-off owl is great too, as is the hare in mid-scratch, and the beetle. (Ah, okay, I particularly liked anything with an animal in it.) As always, I am amused by your false botanical information. But one thing you’re right on — at least, I think — is the wild cucumber. Sorry to hear about your lens mishap, too (“This is why we can’t have nice things!” a wise man once said). I hope your recovery goes smoothly and as quickly as possible! I forgot to mention the cottonwood too — what a cool specimen you found. They have some incredible root systems. They look part octopus sometimes, even when they’re thoroughly on dry land. Beautiful post, Emilio…like taking a little vacation while sitting here at my desk. I appreciate the effort you spent sharing your treasures with us. Thank you. those pictures are beautiful. especially the one with the deck bridge, and the one with the mountains in background, trees, and birds in water. that is beautiful. it takes time to get better. hang in there. Lovely narrative as usual. Such a beautiful place. Thanks for getting the close-up of the gopher snake — the kids really like that one. They’ve held one that size before in central Texas. Glad to hear you’re back in the posting saddle. Hope you’re recovering quickly. I loved all of your photos, but I was really struck by the close up of the snake. What great clarity. I personally like snakes but haven’t had a chance to photograph one in the wild. We just had a rubber boa in our yard yesterday and I tried to get my camera to photograph it, but it slithered into the ground before I got a chance. Thanks for introducing me to a snake I was not familiar with. Looks like a neat snake. Wow, fantastic photos! Love the story telling as well. All but the wide-angle ones were shot with a Nikon D7000 ($1,200) and either the 70-200mm f/2.8 VR (about $1,700) or the Nikon 80-400mm f/4.5-5.6 VR ($1,900 when I bought around 2002). That sounds like a lot of money, and it is, but it’s spread out over a number of years (I don’t anticipate needing a new camera for a number of years). However, the camera is not everything. Actually, except for some specific needs, the camera is less important than the lens and the understanding of what one is doing. In my case, it’s not that I am that great, but rather that through trial and error I figured out what works and what does not. There is some processing involved as well (I shoot RAW pictures, so you have to do something with them otherwise they look bland). You certainly do not need that kind of expensive equipment. Sarah (http://sarahtakespictures.com/2012/05/07/may-7th-pictures-some-vegetable-garden-follies/) uses a point and shoot, and takes amazing photos. The trick is visualizing what you want to shoot, and learning what it takes to get what you want. To that end, photography classes help a lot (Carissa’s class on lighting has helped her improve her photography: http://neophytephotographer.wordpress.com/2012/04/24/day-115-roses/). I did not always have the equipment I have now, and while it does help, I think what helps more is having learned what to do. Shooting birds in flight used to be a waste of effort . . . except it wasn’t. It took me nearly a year of shooting hawks in flight and at rest before I learned how to get successful photos (search many of my posts, or go to my SmugMug gallery for lots of Hawk photos). Even so, I’m still working to improve. For the photos on this post, many were shot from a tripod, but that is unusual for me. I prefer more dynamic interaction with the camera, so I have things I do to help me compensate for blur, shake, etc. For instance, many people respond to auditory input. But, even with great cameras, the first noise you hear is the mirror going up. People tend to equate that with the picture having been taken, when in fact, depending on shutter speed, etc., they are moving the camera before it is done taking the picture. Another thing is anticipatory responses. Like shooting a gun, you brace for what you know will happen, and react to it slightly before it happens. Same as with shooting a gun, you jerk in anticipatory response, and the photo is not as sharp as it could be. With point and shoots this is made worse by the fact their lag is much longer since they use the same sensor for both providing a preview and snapping the picture (that’s why I hate cameras without viewfinders). Finally, meany people don’t realize how much they should shoot. Memory is cheap. If I’m shooting active, moving subjects, I’m shooting multiple shots in burst mode. I do that because while I can control what I do, I cannot control what the subject is doing. I may end up with 4-5 perfect shots to choose from, but I am just as likely to have none, or only one. I am increasing the chances of me getting a good picture by taking many pictures. Most of my shots end up obeying the rule of thirds. But that is not how I shot it. By far, the best performance of the lens and camera is at the center. If I’m shooting something with eyes, they are what I focus on and track. They are always at the center of the picture. When I edit it, I change the composition, making it more attractive. That, combined with lots of shots, means volumes of photos to go through. A tool like Lightroom is indispensable for managing all those shots. The fact that many shots are already near what I want means I can batch process many of them very quickly. Anyway, this is nearly a book . . . there is a lot of information on the internet regarding stuff I talk about here. I’ll also mention that I wrote what works for me. Others have other techniques for what they do. You need to read, practice, experiment, and eventually come up with what works for you. Which brings me to almost the final comment. Many people ask me “how do you do that?” expecting an answer that will let them do the same. That is like tasting a dish, and asking what kind of oven and pan do you use. Sure, they are important, but I can buy the most expensive oven and pans, and never come close to how well my wife can cook, mainly because I am more on the side of eating than cooking. I would have to apply myself to learning, experimenting, failing, and trying again after I learn from my mistakes. That said, the final comment is this. Unlike ovens, cameras these days do a remarkable job of getting good results with minimal effort. The question is really this: Do you want great results? If so, prepare to invest time and effort, because if I have learned something in all these years is this. No matter what it is, it’s not the equipment that produces great results.
. . . except for golf . . . I know it I could just find the best driver out there, I could go pro . . . even though you only hit a driver maybe a total of 13-15 times in a round where I score 85 plus (more often plus than not). No problem. I would say the lenses and camera are fine as many of your pictures are sharp and clear. Not so much on your wildlife pictures, and that is likely because you may not be used to tracking things that are moving and shoot without jerking the camera when you press the trigger (just a guess). It takes practice to press the shutter with “loose fingers” so you are not jerking the camera as you do so, AND to track and keep the subject in focus. That is where burst shooting helps, as you just keep the shutter down, and hence minimize rattling the camera. A good thing to practice on is cars, people running, dogs, etc. Birds are a lot smaller and difficult to keep in focus since they are above your normal plane of interaction. The other things with the wildlife photos, I notice invariably they are in less light. As a general rule, I bump up the ISO to get me as much shutter-speed as possible for the lenses. Rough rule of thumb is the inverse of 1.5 time the zoom. So, for instance, for a 100mm zoom: 100 x 1.5 = 1/150 sec. that is for film. Consumer digital cameras are not full-frame sensors. You would have to check your sensor multiplier, but my Nikon has a 1.5x multiplier. That means that 100mm is really the equivalent of 150mm zoom on a full frame camera. So, the MINIMUM speed should be: 150 x 1.5 = 1/250 sec . . . I usually want 1/2000sec or faster. Then there is Aperture. Small aperture(large numbers) let in less light, but give you more depth of field. My fast lens (f/2.8) has a very shallow depth of field, and it gets shallower at the higher zoom. That means I could have the body of a hawk in focus, but not the wings. The way I handle that is raise the aperture, but that gives me less light, and hence slower shutter speeds. So I have to raise the ISO even more, and risk grainy pictures. If it’s a sunny day, I can shoot at higher apertures and still have 1/2000 or higher shutter speeds without raising the ISO value. On cloudy days I may have to forego the higher apertures, and shoot at very high ISO. Like as said. Lots of options. Based on your photos, Barr Lake State Park must be a real treat to visit. I enjoyed all your shots especially the ones of the mountain and the owls. But the most stunning photos are the ones of the Great Blue Heron. Visually exciting! Lens repaired, and as good as ever. Thanks for stopping by. Looking forward to following your blog . . . if it ever lets me. It’s having problems reaching the server (whatever that means). I loved your nature tour. Some of these birds are in Florida and I’ve been fortunate enough to get photos of some of them. The Great Blue Heron is among my favorites. That was one mighty, plucky and bold bunny – great action shot. Also, disperser, great eye for spotting that owl in the tree. When I went to a swamp tour near our home, I would have missed things had not the photographer directing the tour not pointed them out. Thanks . . . I enjoy writing these because they also serve a reminder for me. Plus, you , know, I’m the biggest fan of both my writing and photography. Thank you Disperser. I am inspired to visit Barr Lake tomorrow and I will be sure to take lots of time and look for all the gems that you found. You welcome. Hope the weather holds up for you. Thanks . . . and I love coming up with captions that amuse me.